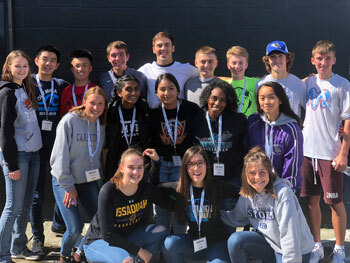 LEAP (Leadership through Education, Activities, and Personal Development), is a student leadership group organized by the Washington Interscholastic Activities Association. The LEAP Committee is made up of student leaders from WIAA member schools throughout the state. Student representatives are involved with WIAA events, meetings and community projects, and have the unique opportunity to be the voice of Washington’s nearly 225,000 student-participants. Each spring, the WIAA invites students who will be entering their JUNIOR year the following fall to APPLY. Approximately eight students will be selected to join the Committee and participate throughout their junior and senior years. The annual application deadline is MAY 31. Please direct all questions to aknapp@wiaa.com.